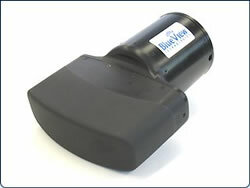 BlueView Technologies provides affordable state-of-the-art compact sonar solutions for Surface Vessel, ROV, UUV, and diver applications. Using cutting-edge multi-beam imaging sonar technology, the ProViewer line of products delivers a quantum leap in performance over conventional sonar systems. BlueView's High definition real-time streaming imagery dramatically increases safety, efficiency and mission success during hull and pier inspection, harbor surveillance, sea bottom search, offshore inspection, fisheries management, and other commercial and recreational applications. Get more, do more with the Nova Ray® ROV Conversion Kit. Just remove the Nova Ray® ROV wings, add the flotation frame assembly, and you are ready to go. With the Conversion Kit, you get two operationally different Nova Ray® ROV's for expanded project capabilities. The Nova Ray® ROV 2-in-1 package works for projects with tight space limitations and vertical maneuvering, and those in challenging currents and cross currents. The Nova Ray® ROV modular platform provides for easy integration of user-defined applictions and equipment. The following are examples of add-ons, and do not limit the user's options. Inspection Manager Enterprise software, from NetLink Inspection Systems, provides a powerful tool capable of life-cycle management for the inspection requirements of company assets (ship hull surveys, offshore platforms, subsea pipelines). NetLink, a provider of software and related services, addresses the need for computerized subsea inspection data acquisition. User defined software can also be integrated. Advanced technology, map-based navigation and tracking solutions are easily integrated to meet user applications. Removing the Nova Ray® patented wings converts it to a conventional Underwater Towed Vehicle (UTV) for use in projects with space limitations. Customers essentially get two operationally different ROVs with both cost savings and increased profitability opportunities. Includes thrusters, flotation frame assembly and light brackets. Available Q3, 2004. Add an altimeter for altitude data and a fourth auto pilot mode. The altimeter measures altitude of structures and objects, range to other structures and objects, and monitors sedimentation or scouring. Also referred to as manipulators, articulating arms are available using customer-specified devices or Nova Ray® electric manipulators (available first of Q3, 2004). Reduce potential down time in the field with an easy-to-install back-up circuit board. Meanwhile, send the original circuit board, at lower cost than shipping the entire ROV, back to the factory for repair. An external camera comes standard with Models 3000 and 3500, but can be add-on to other models. Convert to fiber optic cable for enhanced communications capabilities with smaller diameter umbilical. Tools and parts for basic maintenance and repairs in the field are conveniently packaged into the TAPP (+) Kit. While the Nova Ray® undergoes rigorous Quality Assurance testing, breakdowns can occur on any project site. Thats one of the reason why the Nova Ray® is modular in design. If a part breaks, fix or replace it onsite and get back to work. Return the part to the factory later. The kit includes the Basic TAPS kit items and one each of the following: light, complete circuit board, thruster, actuator and skid. Help keep your project on schedule with the TAPP (+) kit. Beef up thruster power with two, ½ hp thrusters for projects requiring more power. While the Nova Ray® is highly maneuverable, some projects may desire the addition of vertical movement in a confined survey space (ie, port pilings). Nova Ray® offers its vertical thrusters. Or take off the standard wings and quickly convert to the Conversion Kit. User-defined sensors include chemical , biological and radiation detection. All ROVs are hydrophone ready. Nova Ray offers training for customers desiring enhanced operator proficiency to address a wide variety of projects. Training can be customized for user applications and conducted at the Nova Ray facility or customer location. Technical Support and Project Consulting. Nova Ray provides free technical support by phone. Nova Ray also offers fee-based project consultation.